Slight fix of said minor fix without breaking functionality. (Previous version) Minor fix for previewing azerite gear in vendors. Created and maintained by Cogwheel to v2.8.4. Now maintained by Shinisuryu. BuyEmAll enhances the shift-click interface at vendors. This is actually part of the default UI. Enough people don’t know about it due to the fact that there is no cursor and clicking in the box gives no feedback, that I decided to list it here. For instance, if you want to buy 80 pieces of Silk Thread, you currently have to shift-click the thread, enter 20, hit Okay, shift-click the thread, enter 20, hit Okay, shift-click the thread, enter 20, hit Okay, shift-click the thread, enter 20, and hit Okay. With BuyEmAll, you shift-click the thread, enter 80, hit Okay, and confirm that you want to buy more than a stack if the confirm is enabled. While you can disable the confirmation, I wouldn't recommend it unless you're careful with your purchases. Below the box where you enter the amount is a money display. This updates as you change the amount you are going to buy, showing you exactly how much your purchase will cost. The BuyEmAll window has Stack and Max buttons which allow you to enter a full stack or as much as you can afford/fit. Hovering over the buttons shows a tooltip with the number of items you will be buying and how much it will cost. See Notes for information on the maximum you can buy. 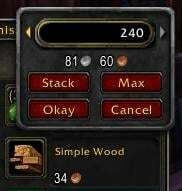 If you already have some of an item, the first click of the Stack button will enter the amount you need to fill that stack. Subsequent clicks will add full stacks to your purchase. Also, right clicks will decrease the amount by one full stack. The amount of free space in your bags. Partial stacks are included in this calculation, as are specialty bags (e.g. free slots in enchanting bags will be only be counted towards your free space if you are buying an essence, dust, or shard). The amount you can afford. The amount available from the vendor (for limited stock items). A breakdown of these numbers is included in the Max button’s tooltip. If you can only buy one item for any of these reasons, shift-click behaves just like a left click, picking up one of the item onto your cursor. If you can’t buy any, then shift-click does nothing. Due to the API for purchasing items from vendors changing, preset stacks effectively are no different than normal items to addons. So, no need to worry about preset stacks anymore, whichever number you enter, is how many items you will get. Usually that is. Minor fix for previewing azerite gear in vendors. Haven't found anything to be broken, TOC bump. You're welcome! I'm just sorry I took so long, I just ended up finding out a handful of currencies got removed, so I redid the list. 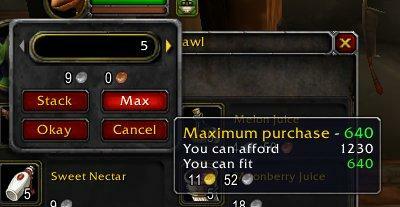 Yeah, I must have never considered the chance of an alternate currency item being sold in groups of more than one. Fixed and uploading now! Last edited by natassja72 : 12-14-14 at 12:20 PM. I see that you've recently updated it. Yeah, nothing seems to be breaking it, but every once in a while I see little tweaks I could do. Good to hear people enjoy it though! Good to hear, sorry for taking so long! That's...odd, it's the same as everything else. Have you tried removing and reinstalling the addon? Hi, I posted tickets on CurseForge without realizing you're probably focused here; I don't know if you read them there. I think it's really easy to add AddonLoader support to this; I tried the change myself and didn't notice any bugs. Oh, sorry, haven't checked things in a bit, work's been draining lately. I'll look into that, thanks. Last edited by Morsker : 09-21-12 at 12:17 PM. Got it, should have a new version up today. Sorry for the delay.